I always answer this question tongue in cheek because what Winnie carries doesn’t necessarily encompass what we carry for her, as a team. What Winnie carries is simple, but what we carry to ensure her success, which in turn leads to our success, tends to be a lot more in depth. If you’re a dog mom or dog dad who’s looking to seek out information about successfully backpacking with a dog, whether for a weekend or for hundreds, if not thousands, of miles, then you’ve come to the right place. If you’re stuck in a place where you believe your dog should carry his/her weight, carrying everything that they need, then I might just break your heart; but I encourage you to please keep reading. So What’s in Winnie’s Pack? 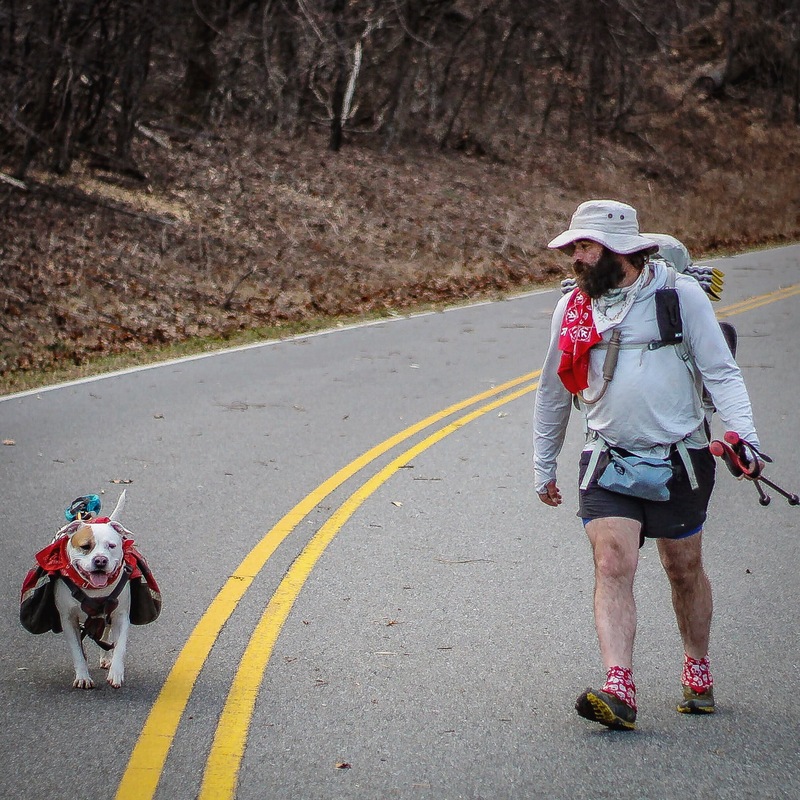 Winnie carries three to five days worth of food, our trash, the Ruffwear Trail Runner Bowl, and a homemade leash leave attached to her pack, and that’s it. Compare this to her complete gear list and you’ll be disappointed simply because I carry the remaining pieces of gear as well as our shared items. I’ve never hiked my own hike. I’ve always hiked her hike, which has also radically transformed my own gear. If she’s not having fun then it’s over. Plain and simple. Winnie in our Phantom Spark 28. 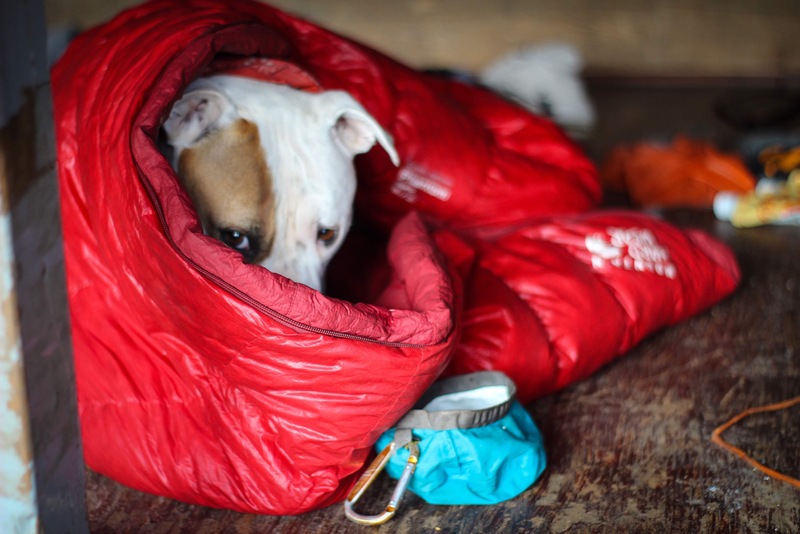 As a long-distance backpacker I understand that if a piece of gear doesn’t have at least two practical functions then I can consider it useless; so how does that mentally play into backpacking with a dog? Especially when considering long-distance backpacking? It’s actually a lot easier than you’d imagine. Thousands of miles together and we have it honed in. First aid kit. This seems like an odd choice but left to my own devices my first aid kit would include duct tape, Tums, and Vitamin I (ibuprofen). Luckily, I’m not as reckless with Winnie’s health as I am with mine, so she has the Adventure Series Heeler first aid kit, which not only includes a dog first aid book and dog specific first aid items, but also items we both can use in the event of an emergency as well. If I was a bona fide solo hiker I wouldn’t carry items such as gauze, medical tape, etc., but I carry them for Winnie, thus carrying them for myself. Poop trowel. Poop is a fact of life, and is definitely a fact of life on trail. Part of LNT (leave no trace) is responsibly disposing of your poop and the poop of our furry friends. Microbes need the ability to break it back down and our diets don’t involve things that wild animals should be digesting if we poop on the surface. Not to mention surface poops are disgusting. Burying it is the best solution if you can’t pack it out. Change my mind. Round and round our pad with wet feet on the ALT. Sleep setup. 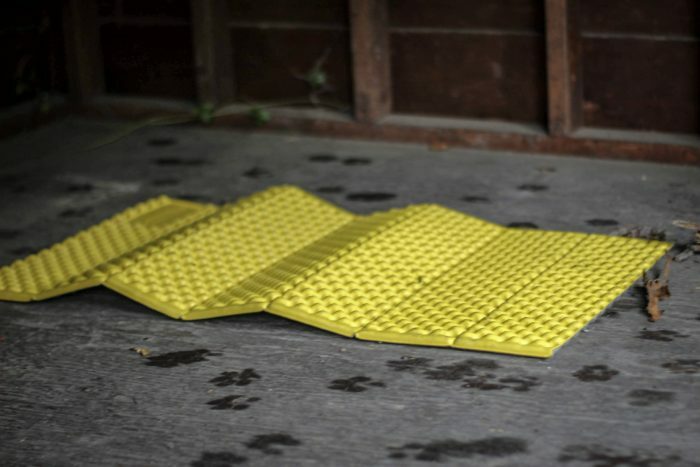 I know plenty of people who have a separate sleep setup for their pupper and while sharing a sleep setup has a few downsides, I find that there are many, many more upsides. Winter and cold weather camping mean more warmth for both; I have more control over Winnie in our tarp and especially if we’re in a shelter with other backpackers, and she just genuinely enjoys being a little spoon. We use the Mountain Hardwear Phantom Spark 28 and the Therm-a-Rest Z-lite (cut in half). Shelter setup. We use the Big Agnes Onyx UL Tarp with ultralight Tyvek underneath us when not in a shelter or lean-to. Kind of a self-explanatory category. Carrying an extra shelter makes no sense. Winnie taking her dear sweet time doing the evening dishes. Obviously, I carry our shared gear. If I was a backpacker who hiked without his dog I’d be carrying those items anyway (except for the first aid kit; that would be drastically dialed back). In conjunction with our shared gear I keep a lightweight, retractable leash carabinered to my left shoulder strap near my hip belt, poop bags for when we’re in town, her tuna packets and olive oil (olive oil for her dry food at breakfast and dinner and two tuna packets for lunch), and any dry food she may need if we’re beyond five days in between resupplies. I also carry her water. Winter parka. In cold weather (like what we’ll most likely experience down south once we flip), I carry her Hurtta Summit Parka during the day so she can wear it at night. In extreme weather I also carry the Hurtta Slush Combat Suit for her. Both of these are bounce box-type items. Paw care. Winnie does not use booties in any way, shape, or form. We use Bag Balm for any necessary nighttime moisturizing and outside of that we use Musher’s Secret, Musher’s Secret, Musher’s Secret. I cannot emphasize this product enough. Snow, ice, sand, rocks; it’s Musher’s Secret. If you hike or backpack with a doggo and don’t use this product, get on Amazon right now and order it. This is the item. Winnie’s pack. Winnie uses the Mountainsmith K-9 Pack. Like human packs it comes down to a matter of preference as far as style and Winnie prefers the saddlebag style pack over what other brands offer. She’s been using this style pack for close to 3,000 miles and this is the same pack she’ll be using for our AT thru-hike. Hydration and food bowl. 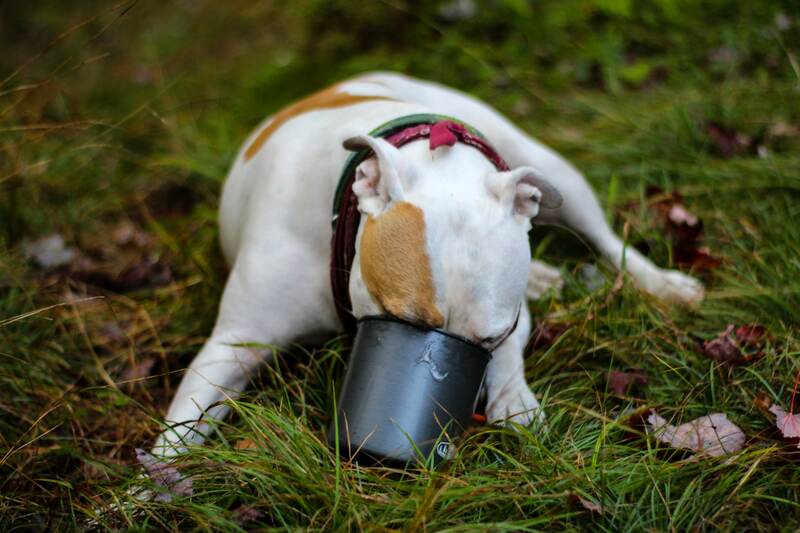 We use the Ruffwear Trail Runner Bowl. Super ultralight and compact, but a bowl’s a bowl. Food. Ask any hiker about food and nutrition and it becomes a very personal topic. I have found that the Purina Beyond salmon and pumpkin super blend mixed with olive oil is exactly what she needs for breakfast and dinner while on the long haul, but it’s up to you as a dog owner to figure out what diet works best for your pet. We will be ordering her food in bulk ahead of time and this will be a mail drop item since not all small town stores carry this particular food item. I love learning from you. Preparing for my AT thru hike has been an amazing adventure in itself. Preparing for pup, Zaffre, adds a whole new aspect! Thanks for breaking things down for me, having only done shorter backpacking trips with him ( 10 days or less) I was able to hone in some aspects of the trip but you really solidified a couple things for me! Thanks for the info! !